Fry sausage until brown, then remove it, leaving grease behind. Cut bacon into 1 inch slices. Fry until crisp. Remove excess grease from dutch oven. Dice onion, green pepper, red pepper, and mushrooms. Add sausage, onion, garlic, bell peppers, and mushrooms to dutch oven. Saute until vegetables are tender. Mix eggs and milk in a bowl or zip-loc. 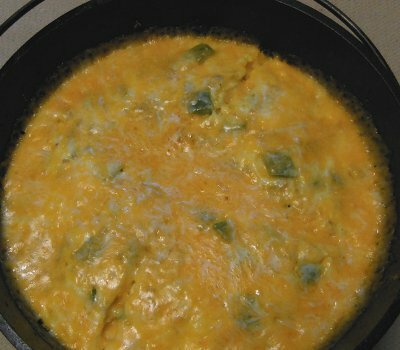 Pour eggs into dutch oven. Cover and Bake at about 350 degrees for 20 minutes, or until eggs are firm. Spread cheese over eggs. Cover and let stand until cheese is melted. Serves: 8 using picante sauce as they choose. Let me know how you enjoyed your Mountain Man Omelette! This is the perfect breakfast for camping. I adjust the recipe according to how many people I'm feeding.